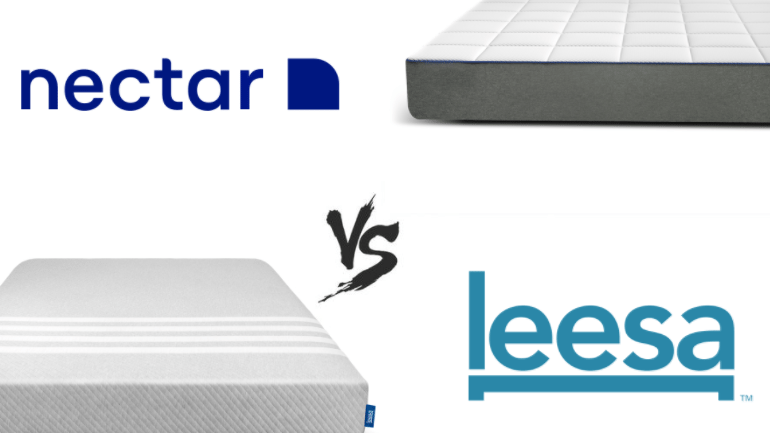 Quick Take: Today we’re going to do a Leesa vs Nectar mattress comparison, so you have a better look at both mattresses. As both mattresses offer positives and negatives, this could come down to how firm you’d like a mattress. As you will see further in this Leesa Nectar comparison, Leesa is the softer option and Nectar is on the firmer end of the spectrum. Keep reading this Leesa vs Nectar mattress comparison to learn about everything from mattress dimensions and prices to find out what each mattress is made of. Check our reviews for Leesa and Nectar to learn more! Chances are, before you got to this Nectar vs Leesa mattress comparison, you’ve read reviews on both mattresses. The benefit of a comparison like this is for you to get a real side-by-side look at what both brands have to offer. As both mattresses come from companies that are primarily online, you can expect lower prices and a risk-free trial. Here, you will find out the exact prices for each option and if there are any coupon codes that will help to lower the price. For instance, currently with Nectar you can use SLEEPZOO125 to save $125 off your mattress and get two free pillows! Leesa also offers coupon codes and discounts throughout the year. Leesa is a great option if you’re concerned with giving back any way you can. Leesa donates a mattress to a homeless shelter or a group in need with every ten mattresses they sell. As of this Leesa Nectar comparison, Leesa has donated thousands of mattresses. Leesa is a 10” mattress that will work for most sleepers. They offer one firmness level and each mattress is constructed in an identical way. The mattress is a 2” layer of Avena foam, 2” of memory foam, and a 6” layer of high-density support foam. The combination of these layers offers a mattress that is durable, comfortable, bouncy, and cool. If you have trouble with aches and pains, the combination of foams may lead to a reduction of your pain, making it easier to sleep each night. Nectar starts with a cover that is pretty special. It’s made of Tencel, cotton, and gel-infused memory foam. This is going to draw the heat away from the mattress and it’s going to be your first layer of comfort. Inside the mattress there’s a layer of gel memory foam that is more responsive than regular memory foam. This is followed by more memory foam and finally a high-density poly foam that serves as the mattress foundation. The mattress layers offer contouring to your body and promote circulation which promotes healing on sore and aching muscles. On a scale of one to ten, Nectar would be a 7.5. This makes it a fairly firm mattress. That said, there is some softness to it, so it’s considered medium-firm, despite it being more firm than soft. This means that Nectar works for most sleep positions. It is recommended if you sleep on your stomach, but will also work well for back sleepers or combination sleepers. If you want something firmer that still offers a bit of contour and form to your body, Nectar would be a good option for you. Leesa is also listed as medium firm though it’s definitely the softer of the two mattresses. On the same ten scale, Leesa would only be about a 5.5. So, while Nectar is a firmer mattress, Leesa is definitely a softer one. Side sleepers are likely to be delighted by the comfortable softness that will hug your hips and shoulders as you sleep. Most sleepers report that they don’t feel a thing when they are sleeping on their Nectar mattress. Couples who sleep together often deal with the struggle of waking each other up with every movement when they are on some mattresses. With Nectar, you can toss and turn through the night and you won’t notice anyone is moving at all! If tossing and turning is a problem, the increased pressure relief may allow you to find a comfortable spot to sleep throughout the night. If not, even if you’re moving you won’t need to worry about waking the one next to you! Leesa also deals with and eliminates motion to provide a more peaceful sleeping environment. Leesa is made of foam, which is known for being excellent in the area of motion transfer. With a foam mattress, motion energy is trapped and dissipates in the foam without being brought to the surface and throughout the mattress. In short, you can move with the freedom to know that you won’t have to feel every movement that you make. Like Nectar, some sleepers say that they find they move less thanks to the more comfortable mattress. Still, if you do move, you’re protected with a nearly motion-free mattress. Leesa is considered to be a luxury mattress. That said, just because it’s a high-end mattress doesn’t mean you’ll pay a high-end price. Leesa offers all of the standard mattress sizes for anywhere from $600 to $1,100 without the use of a coupon code, which are often available. Remember that this price gives you the chance to help someone in need get a mattress of their own. Every ten mattresses sold means that one is given away to help those that need it most. The price of a Leesa is nothing to complain about, but if you want a real deal, Nectar might be the way to go. It’s hard to beat anyone offering a comfortable King mattress for under $800. Financing is also available if you need it. You can use the code SLEEPZOO125 during your checkout through the Nectar website to save $125 and receive two free pillows. The prices in the table below already include the discount you will receive with our coupon code, SLEEPZOO125. Both mattresses come with a risk-free trial, but Nectar’s lasts for a year! Every Leesa mattress comes with a 100-night risk-free trial. This trial allows you to pay for your mattress when you get it, but it entitles you to a full refund if you request one in the first 100-nights of owning your Leesa. The process is fairly easy. You just contact customer service before the end of the trial and they will make sure your mattress is removed from your home. If they can donate it to someone in need, they will. You’ll get your money back and have the ability to get another mattress. If you keep the mattress a 10-year warranty will be included. Nectar offers an even better deal when it comes to a risk-free trial. The Nectar no-risk trial lasts for a full year! Take all the time you need to determine whether or not Nectar is the best mattress you’ve ever owned. If you’re unhappy you’ll be able to return it without a hassle. Nectar will handle the return of your mattress and you’ll get something better suited to you. Very few companies offer a full year to get to know your new mattress, so Nectar is the clear winner in terms of trials. They also offer a warranty to protect against manufacturer problems with the mattress. Leesa and Nectar both offer redeeming qualities. Both offer comfortable options that will keep you cool and relieve some aches and pains while you sleep. If pricing or risk-free trial length matter to you, Nectar is the choice for you. If you’re more worried about the firmness of your mattress, the choice will depend on whether you want soft (Leesa) or firm (Nectar).